Today is Jonas’ 90th birthday and to celebrate, we offer all you diarists a a few stanzas quoting from one of his diary poems written in New York 10 years ago on the day before his 80th birthday. As you will see it was written at a time of sadness when his friend, fellow filmmaker and co-founder of Anthology Film Archives, Stan Brakhage, was dying of cancer. It also expresses his antipathy to the world of consumerism embedded in this time of the season and his belief in the irreversible entropic decline of Western civilisation that, according to Jonas, we are presently undergoing. You might think that seems a curiously pessimistic note on which to celebrate a man’s life to date, particularly one that has been dedicated to expressing the joy of life in the small but lyrical art forms, but you’d be forgetting that his worldview and the poem itself expresses a great deal of tender and altruistic humanity, as well as pessimism – it also reminds us at this time of year that material acquisition is not the greatest thing to celebrate in the midst of deep winter, but instead to consider the overlooked and the marginalised, realising the importance of togetherness and community, which is the best of human society. Perhaps most importantly, it also expresses Jonas’ resistance to “growing up”, which could very well account for the long and healthy life he continues to live. about the real ways of this world. selling things I have no use for. From ‘End of the Year Letter to Friends’, 3rd January 2003 in Letters, etc. For the complete poem, go to Poems on Jonas Mekas’ website. The Serpentine Gallery is a remarkably suitable setting to host Jonas Mekas’s work. Its location stretches inside Kensington Gardens where trees and ornamental flowerbeds surround the gallery’s building from the South to its North rooms. All his life Jonas Mekas celebrated the small forms of cinema. Its lyrical forms, the poetry of what it is to live, notice and sing. The diary impulse of Mekas’s new feature-length film, Outtakes from the life of a happy man (2012), is idyllic in this architecture and pastoral setting. Mekas has a strong online presence with his brilliantly designed website where one can see and read selected works and more recently a new DVD boxset of his films has been released in France. So, his work is accessible, but as a leading figure in avant-garde and independent cinema with works spanning a 60-year career, the majority of it is made on film. In 2011 his film Sleepless Nights Stories (2011) and co-directorial work with JL Guerin, Correspondences (2011), screened at the 55th BFI London Film Festival. A year later he is back in London to mark his remarkable activities as filmmaker, poet and independent cinema producer since he arrived in New York in the late 1940s, following a long and difficult journey from Second World War stricken Lithuania. Mekas’s long journey would be unimaginable to capture in the gallery space, limited as it is to just a small number of rooms. Or could Mekas’s body of work make sense of the gallery space? As I walked through the exhibition, I realized these boundaries were in constant flux. The more I looked through this survey of Mekas’s work with moving images, poetry and photographs dating from the 1950s to the present day, the more I discovered about his manifestos for promoting avant-garde cinema and its filmmakers alongside his support for independent cinema from abroad. Selected especially for the Serpentine Gallery exhibition, To London with Love (2012) is a portrait of the London-based avant-garde filmmakers in a set of 25 photographic prints from 16mm frames. These are images Mekas recorded with his Bolex camera during his visit to two landmark events that took place in London’s National Film Theatre (NFT): the International Underground Film Festival in September 1970, and the International Independent Avant-Garde Film Festival in September 1973. But Mekas’s support for the international avant-garde film community is not just a part of his life. It’s his family and more importantly his life diaries in moving images and words. A series of 80 prints that are on display, My two families (2012), are all extracted from his captivating new film featuring in the Serpentine Gallery exhibition, Outtakes from the life of a happy man. The 43.2×27.9 cm wall display not only gives the viewer an insight into Mekas’s film but, also a rich glimpse into the lives of his family, friends and colleagues. It includes Anthology Film Archives’ patron Jerome Hill alongside filmmakers and artists such as Harry Smith, Kenneth Anger, Pier Paolo Pasolini, Hollis Frampton, Andy Warhol and Salvador Dali. Together with Peter Kubelka, P. Adams Sitney and Stan Brakhage, Jonas Mekas founded the Anthology Film Archives in 1969. To this day Anthology largely showcases avant-garde cinema alongside many other activities promoting and caring for the work of independent filmmakers. Its original fabric banner designed by Jerome Hill, is among the objects in the exhibition and laced next to Laboratorium Anthology (2011), a record 101 min long film celebrating the work undertaken by Anthology Film Archives. The Jonas Mekas exhibition of film, video and photographic works at the Serpentine Gallery runs from 5 December 2012 to 27 January 2013. 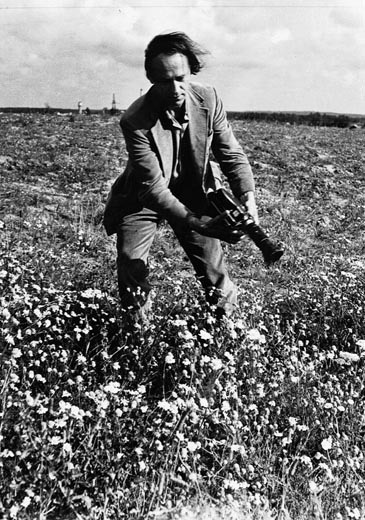 Brief Glimpses of Beauty: The Films of Jonas Mekas season curated by Mark Webber runs at BFI Southbank from 6 December 2012 to 28 January 2013. The evening is initiated with a beautiful extract from his latest work, Outtakes From the Life of a Happy Man. After, Mekas takes to the stage with agile aplomb, belying his almost 90 years, the ensuing interview focuses predominantly on his early experiences of cinema, and his first works as a film diarist. Just as Alfred Hitchcock could be cruelly dismissive of his own work, so Mekas is startlingly unpretentious about his methodology – his compulsion to film has led to an enormous library of film and video footage, as well as thousands of hours of audio. Every film is carefully catalogued – “I don’t trust my brain” – for revisiting later. Despite their age, the films are in remarkably good nick, still bursting with vibrant colour. The reason? Taking inspiration from Henri Langlois of the Cinémathèque Française, he frequently screens the films, not allowing them to rest and be eaten away by chemicals, Mekas claims. Lost, Lost Lost, one of his most celebrated films, was completed in 1976, despite featuring footage from his arrival in New York in 1949 to 1963 – the intense, painful homesickness of that era made it too harrowing for Mekas to revisit any earlier. Despite this, Mekas remembers the excitement of discovering American cinema – after being weaned on Soviet propaganda in Lithuania (his only western film experience was seeing a forgotten melodrama, preceded by a Mickey Mouse cartoon, when he was 14), he describes galloping away from his factory work with his brother, Adolfas, at 5 in the afternoon to make every 5.30 screening – “we were dry sponges ready to absorb everything”. Two months after arriving in New York, he bought his first camera and started filming, usually around immigrant communities. He is cheerfully mocking of the meaningless moniker often attributed to him – “the godfather of American avant-garde cinema” – preferring to describe himself as more of a midwife. Certainly by his arrival in America, figures such as Maya Deren and Kenneth Anger were already well established. Hebron reads extracts from his diaries at the time, including his confident manifesto – ‘A Few Advices to a Beginning Filmmaker’ (sic). While some draw laughter from the audience (“Ignore scripts. Shuffle pages around like Orson did”), the final pointer – “Invent cinema from the beginning, as if no one had done it before you” – draws applause. The Q&A is thrown open to the audience. Some questions he refuses to answer – “that would take a book!” he replies to broad enquiries about the New York arts scene. No, he doesn’t watch much on YouTube – he simply doesn’t have the time. His great bugbear is so-called “creative people”, who endlessly reinvent objects perfected by craftsmen over centuries for no particular purpose – “I would send all modern designers to a distant island, surrounded by sharks.” A Lithuanian woman in the front row grabs the mic and exalts his artistic standing with the excitement a teenager might show Justin Bieber – her love and admiration for Mekas’ work is palpable. Watch out for more audio podcasts from this event coming soon! Well howdy there, all you friends and budding audiovisual diarists! We at the Jonas Mekas Diary Film Project are getting really excited as the time draws near when Jonas himself will be with us in London to lead a workshop in diary filmmaking, providing our talented young students with guidance and sage advice gleaned from over 60 years of making handmade independent films and of being an activist, journalist and irrepressible advocate for independent film. Of course that’s not all he’s here for: his visit will coincide with the launch of major retrospectives at BFI Southbank and the Serpentine Gallery – alongside further retrospectives at the Pompidou Centre in Paris and Anthology Film Archives in New York celebrating his amazing 90th birthday – with no sign of anyone stopping him from doing what he loves anytime soon! We’ll be busy providing you with frequent blogs, explaining the types of processes the students will be working with and reporting on the whole season as it unfolds, giving everyone the chance to be included in this fantastic once-in-a-lifetime series of events, whether or not you can be there in person. Not only will we be actively blogging about it in text form, we’ll give you the chance to experience it close-up with photos, video (including some shot on 16mm film with the same type of Bolex movie camera used by Jonas himself), audio clips and links to resources all across the web. Check out this clip of Jonas’ film, As I Was Moving Ahead (2000), for a good example of the kind of material we’ll be working with. This clip shows how Jonas has spent his lifetime attempting to understand the chance encounters of his strange exile in America from Lithuania. The students are encouraged to explore the ideas represented here and think about their own experiences, travels and family lives. Furthermore, we’ll be providing you with context and background with resources including an online tour of Mekas’ life, work and his most enduring achievements, plus pages introducing the lasting legacy of those achievements: the people, places and networks that enable these types of films to be seen now and by future generations. We’ll also point you in the right direction to find out more online and to further viewing and reading. Here are some delectable dates for your diary, all you developing diarists! Wednesday 5th December: the Serpentine Gallery’s retrospective show opens with a new work by Jonas – we’ll be there right at the opening and we’ll tell you all about it. Thursday 6th: Our students will meet and have a walk-through at the Serpentine Gallery where they’ll get a first-hand private experience of the show and Jonas’ work before they get the chance to see Jonas interviewed In Conversation with former London Film Festival director Sandra Hebron and British filmmaker Mike Figgis in NFT1 at BFI Southbank that same evening. That’s probably about as close to our idea of a perfect day as it gets! Friday 7th: the BFI’s retrospective screenings of Jonas’ work, curated by Mark Webber opens with Lost Lost Lost (1976, 178 mins) and the students are encouraged to attend – we’ll blog about it and show you a clip or two. In the meantime, if you want the chance to see it, get your tickets here. Then throughout December we’ll be blogging about the major screenings in the BFI’s retrospective of Jonas’ work. Sat 8th: at the Serpentine Gallery, Saturday Seminar with Jonas – the students get to meet Jonas himself and hear all about his ideas and his work and to ask him for advice on how best to approach the diary videos and film work they will make on the course. Wednesday 12th: an evening with Jonas Mekas and Friends at the Serpentine Gallery – music, poetry and surprises as Jonas holds court with some of his friends. Friday 14th and Saturday 15th: two day-long practical workshop sessions at no.w.here with filmmaker and head of the lab and education dept at no.w.here, James Holcombe. James will take us through how the Bolex camera that Jonas used works, allowing the students to shoot, process and handle 16mm film so they can explore its textures and physical characteristics. On the second day the students will shoot and develop rolls of film that they will later use in their diary video work. These two days will be among the highlights of the workshop programme because no.w.here is the successor organisation of the London Filmmakers’ Co-Operative, which was founded in London in 1966. It was directly inspired by the Filmmakers’ Co-Operative that was founded in New York by Jonas. Over the holiday season the students will work on their video productions. They will have access to the BFI’s digital edit facilities during that time. 12th January 2013: there will be a Jonas Mekas Study Day at BFI Southbank, including screenings and discussions with a panel of experts, led by curator Mark Webber. 26th January: the workshop culminates with screenings and discussions of students’ work in the afternoon. Then, that evening students are invited to attend the final screening in the BFI retrospective, his most recent film and tour through the twilight of Jonas’ insomnia, Sleepless Nights Stories (2011). It features Bjork, Harmony Korine, Yoko Ono and other friends. You can read a review here. Finally your last chance to to visit the Serpentine show will be on Sunday 27th January. WOW – what a packed programme, eh folks! We’ll be back next week to tell you all about the opening of the Serpentine show, the launch of the workshop programme and Jonas’ In Conversation – so stay tuned and check back soon! The Jonas Mekas Diary Film Project is a workshop programme intended as an introduction to working with the diary form as a cinema of free and poetic self-expression. It is aimed at young people with little to no experience of working with film and video and encourages the students to explore the relationship between themselves and the medium, engaging with their past and present, their friends and families and their immediate environment, putting ordinary lives into the frame, exploring the beauty and the poetry of the every day. The workshop will take place in London, England and will be led by one of the true pioneers of the diary film, Jonas Mekas, a Lithuanian-born New Yorker who has been a tireless champion of independent cinema for over 60 years. It coincides with twin retrospectives of his work at BFI Southbank and the Serpentine Gallery. This site is a resource that will chronicle the workshop – a diary of the diaries, as they evolve – and will form a legacy for the project, allowing all you young students around the world who are hungry for creative development, but who are unable to participate, to also get something out of the workshop. We hope it will encourage you too to go out there with a video or film camera and make something personal, honest and truthful. The workshop is a partnership of the BFI, Serpentine Gallery, no.w.here lab, University of the Arts, London and Anthology Film Archives. Find out more about BFI Education here at our blog site. This site is in development so please check back soon for updates.